After a brief run in theaters, the Joseph Kahn-directed film is now available on demand. Bodied, the battle rap comedy film produced by Eminem, is now available to stream on demand via YouTube Premium. The streaming service is available for $11.99 a month, with a one month free trial. The film follows a white student named Adam Merkin (played by Calum Worthy) whose surprising success in the world of underground rap battles becomes a flashpoint of controversy. Bodied is directed by Joseph Kahn and written by Alex Larsen. 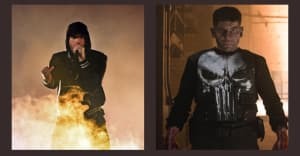 Eminem released his new album Kamikaze in August, and performed the single "Venom" on top of the Empire State Building for Jimmy Kimmel Live!.